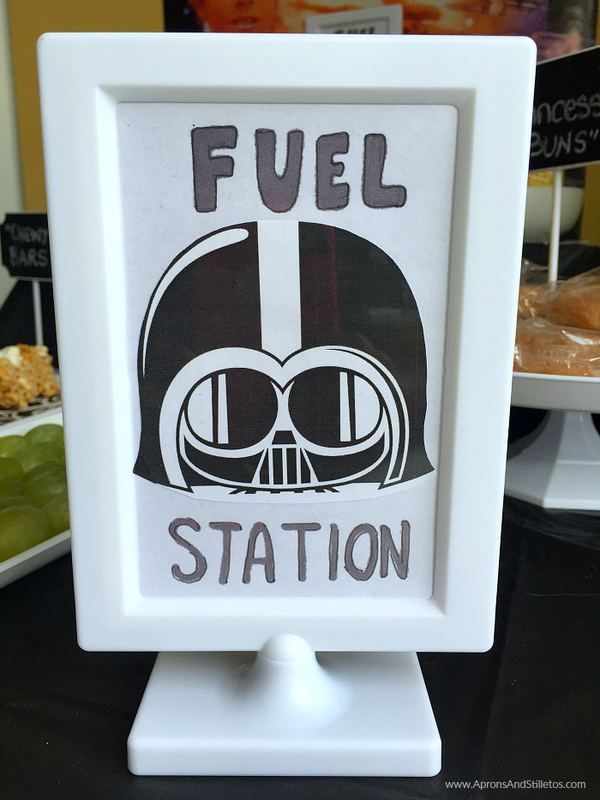 I don’t typically prepare sweet breakfast food, but when you’re going to see Star Wars™ you make an exception. We’re going to see Star Wars™ so I want to share a super fun idea with you guys. 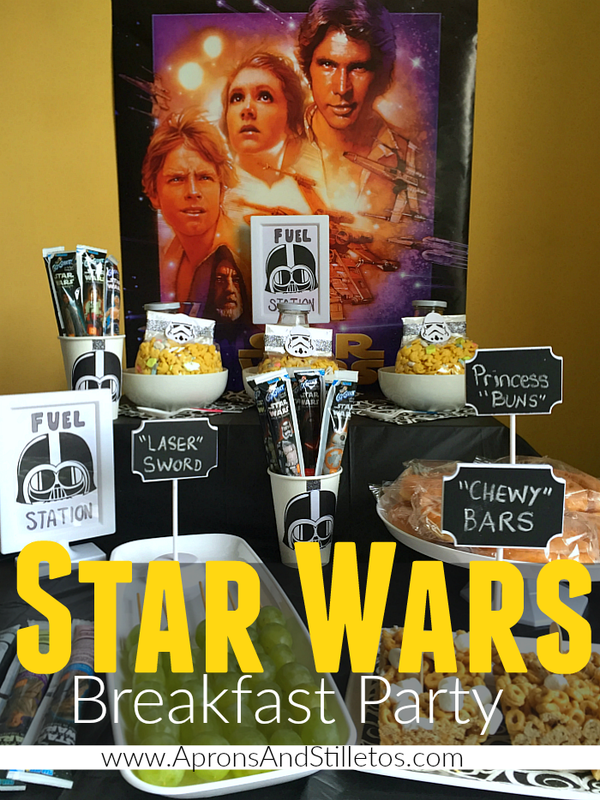 If you’re taking your kids this breakfast buffet would be a great way to surprise them. 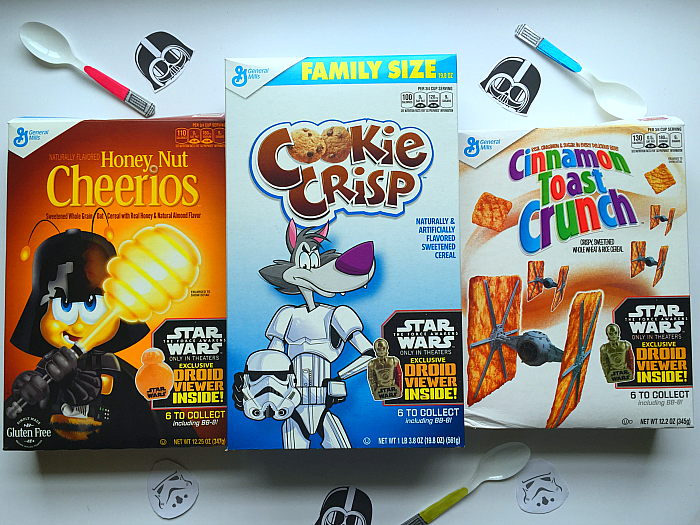 I put together this easy Star Wars™ themed breakfast the week the kids were home for Thanksgiving. 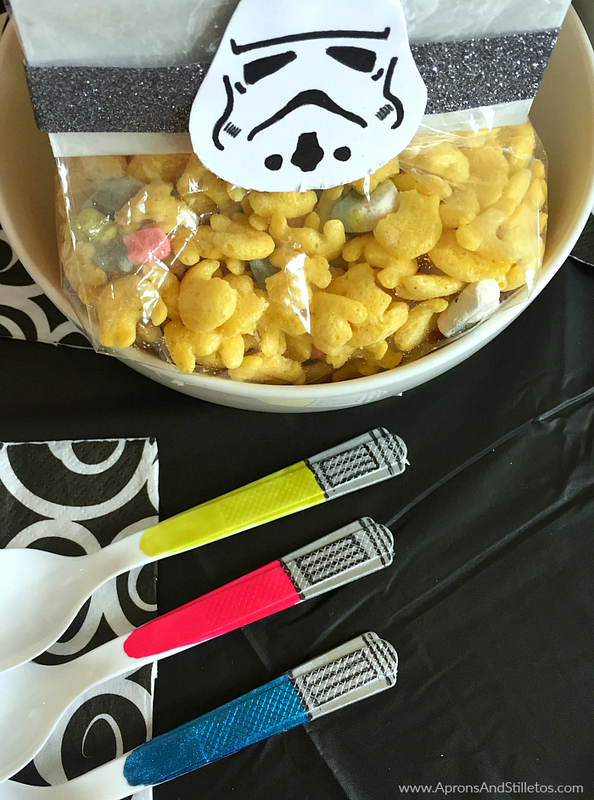 I served several of the new Star Wars™ cereals, honey buns, fruit and cereal bars all inspired by the movie. I made an easy chewy breakfast bar recipe using cereal. The bars were ooey, gooey, sweet and chewy. They are easy to make and only require four ingredients. 1. In a large pot, heat butter on medium heat until melted. 2. Turn the heat to low, add in the marshmallows and stir. 3. Once the marshmallows are all melted, pour in the cereal and stir until well coated with the melted marshmallows. 4. Pour the mix into a 9×13 pan and press down until the cereal, marshmallows mix is flat in the pan. 5. Sprinkle remaining 1/4 cup of marshmallows over the mix and press down on them slightly. 6. Refrigerate for 15 minutes until the marshmallow hardens. Remove and cut into about 20, three ounce bars. Once my chewy cereal bars were done and cooling in the fridge I began setting up my breakfast table. To start, I printed off some super cute printables from the sweet Jaimee at CraftInterupted. I wanted a monochrome color scheme and her printables worked perfectly. I scaled them down a few sizes. I needed them to be small enough to decorate my premeasured cereal bags. 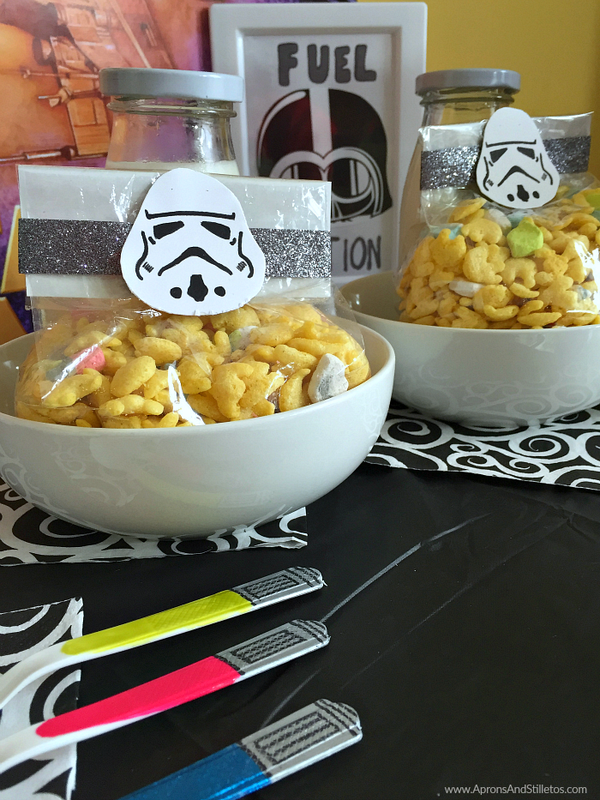 Each bag had a cup of General Mills Star Wars™ cereal in it. I also included pre-measured milk bottles in each bowl. 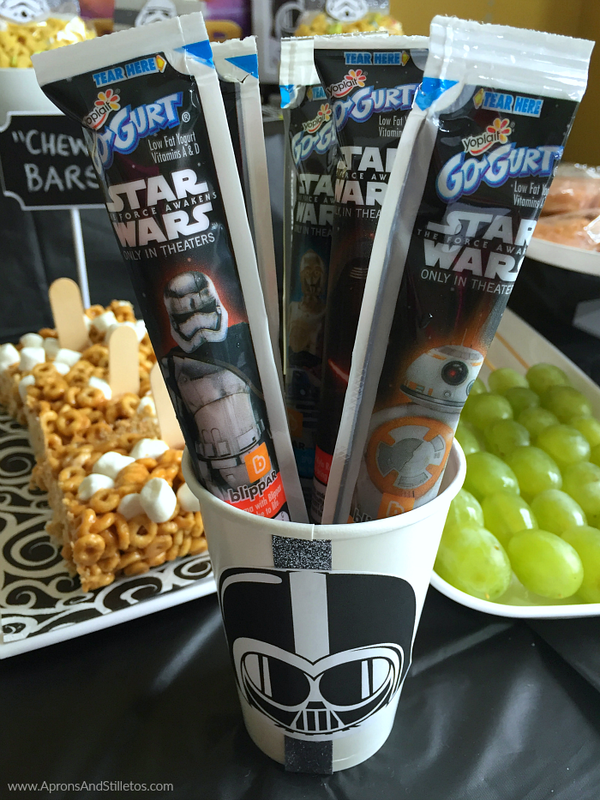 Using more printed images, I decorated white cups which made a great place to corralStar Wars™ themed Go-Gurt® yogurt tubes. 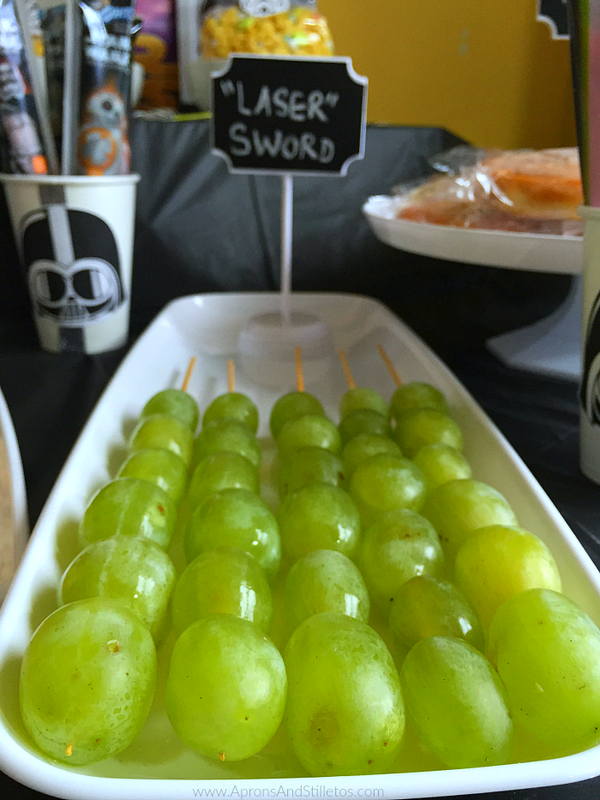 The Go-Gurt® had so many yummy flavors which taste great on thier own or as a condiment atop these “laser sword” grape kabobs. These fruit kabobs were an easy way to incorporate themes from the movie. But I couldn’t stop there. I wanted to honor the princess in the movie and her infamous buns. The very first time I saw the movie I wanted to wear my hair in buns. Back then I felt like I could wear my hair in two buns the rest of my life and be aye-oh-kay. 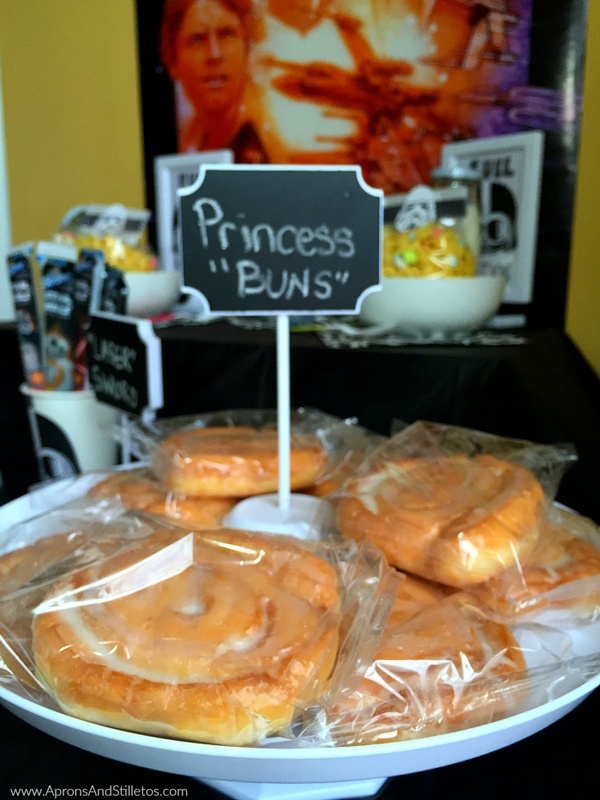 My kids love honey buns and I thought this was a great way to honor the princess. I can remember watching my first Star Wars™ movie back in the 80’s with my parents. It was my first memory of the movie theater and one of my best experience with my parents. I’m looking forward to recreating similar memories with my own kid this holiday season starting with this breakfast. Many of the decorations were made using the printables I mentioned. I just resized them up or down to suit my needs. The only thing I made from scratch were these laser sword spoons inspired by the movie. I used silver nail polish and a permanent marker to create a faux laser sword handle and I used green, pink and blue nail polish to create the light part of the sword. 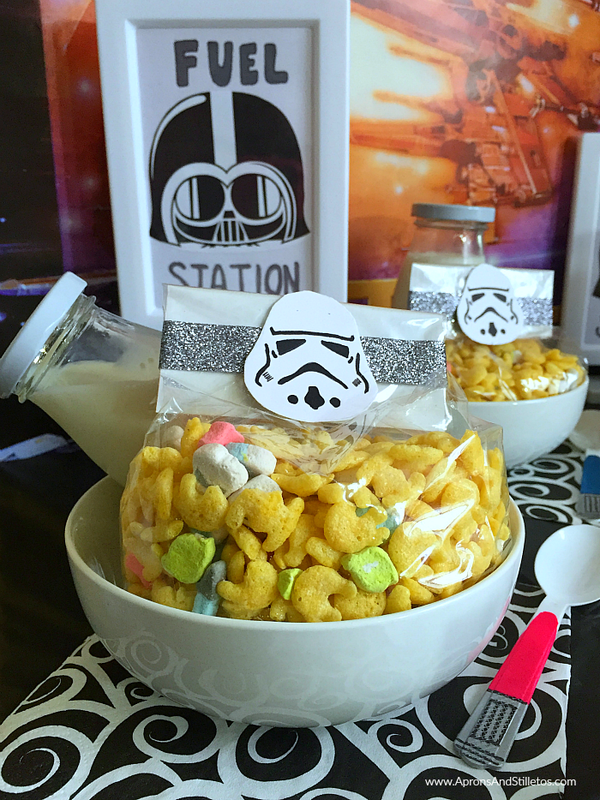 I hope you guys are inspired to create your own Star Wars™ themed breakfast party. 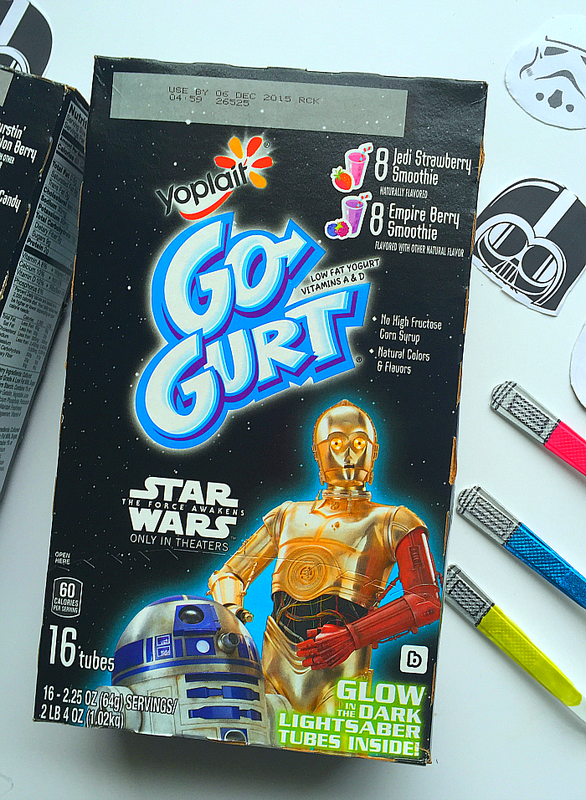 You can find all of the Star Wars™ cereal and Go-Gurt® products at Walmart. For more ideas to awaken your tastebuds check out these recipes from General Mills and these recipes from me. Okay, I have never even seen Star Wars (I know, I know, heresy!) but I would totally attend this breakfast! LOVE your creativity! This sounds like an amazing party plan! We love Star wars! What a fun breakfast party! I would have so much fun creating and being part of this. What a fun way to get into the spirit of the movie. I like all these fun breakfast treats, but all of them could be enjoyed at any time of the day. 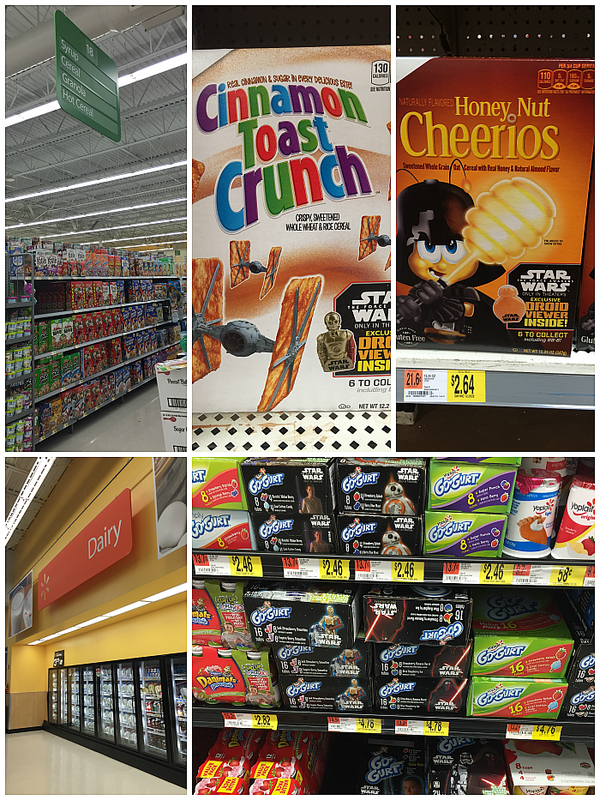 Cinnamon Toast Crunch bars all the way here! These treats are so easy to make. I love that they can be made in advance of the party. What a cute idea for breakfast. We can't wait to see the movie. That looks like a fun breakfast! You really went all out with details. I remember when Star Wars first came out and we went to see it–AWED was what we were–that opening scene-I'll never forget it. What a fun idea! 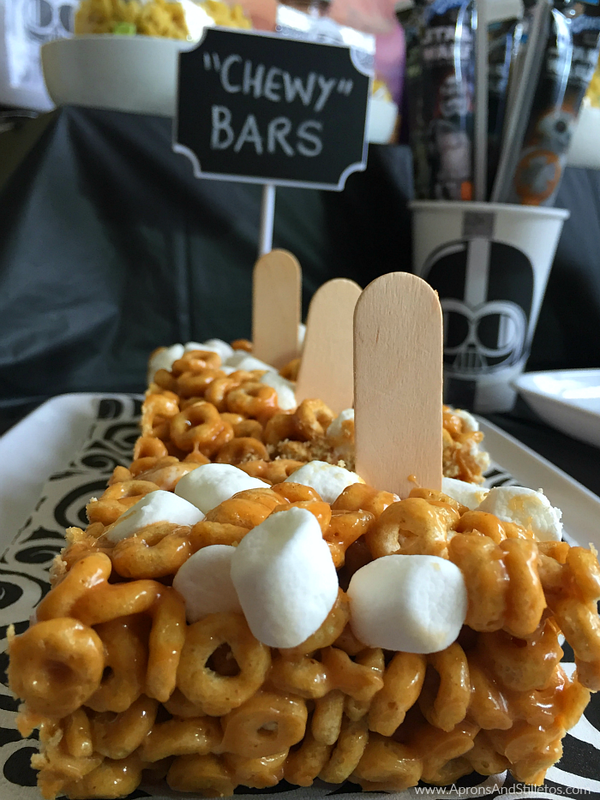 The party bars made with the marshmallows look and sound absolutely delicious! Thanks sweetie!! I wasn't sure if the spoons would looks cheesy, but when they were done and the kids saw them they immediately made the connection. So much detail all the way down to the spoons. My kinda planner. Love all of this what a treat for the kids. Also, would be great for a birthday celebration! Love it! !